For some people planning to go walking in the Lake District, the only place in the Langdales to be is Great Langdale, the larger of the two valleys separated by Lingmoor Fell. In some ways this is understandable. The Cumbria Way passes along the valley floor. 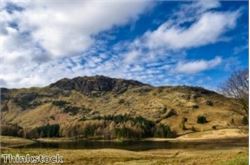 The Langdale Pikes tower above and offer a fine climb, with the famous Dungeon Ghyll Falls below and the challenging cliffs of Pavey Ark above. Great Langdale also offers an approach route to Scafell Pike, passing Angle Tarn on the way. By contrast, Little Langdale is shorter and not surrounded by such high crags and peaks. But that should not detract from its own numerous qualities. These may be best highlighted by a guided walk organised by national park rangers for September 15th, which will feaure the tarns and fells of the valley. Starting at the Tilberthwaite Quarry Car Park near Coniston, the route will include a climb of Lingmoor Fell, which contains its own tarn, before descending to Blea Tarn, one of three bearing that name but easily the most famous, even if the description of it in Wordsworth's The Excursion as a "quite treeless nook" is out-of-date amid the conifers, rhododendrons and even a monkey puzzle tree. While these two stretches of water strictly belong to neither Great nor Little Langdale, the trek also takes in Little Langdale Tarn itself, the largest of the three. This stands very close to Slater's Bridge, a stone crossing on the route. The floor of Great Langdale lacks any comparable sheet of water, its only 'tarn' being an artificial duck pond on private land near Baysbrown Farm. Near Little Langdale Tarn is another highlight of the valley, Cathedral Cave. Created by quarrying, it offers a tunnel people can walk through when the water table is low, while the pool in the main part of the cavern includes a sunken boat. So for those yet to discover the 'other' Langdale, now may be a great time.